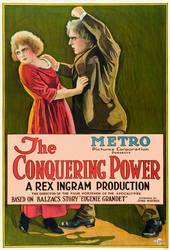 The Conquering Power (1921 in film) is an American silent film romantic drama directed by Rex Ingram (director) and starring Rudolph Valentino, Alice Terry, and Ralph Lewis (actor). The film was based on the novel Eugénie Grandet by Honoré de Balzac. After the death of his father, young dandy Charles Grandet (Rudolph Valentino) is taken under the care of his uncle, Monsieur Grandet (Ralph Lewis (actor)). The miserly Grandet, despite being the wealthiest man in his province, forces his family to live in poverty and schemes to cheat his nephew out of his inheritance from his father. Charles falls in love with Grandet's daughter Eugenie (Alice Terry) but Grandet condemns their love, and sends Charles away. While Charles is away, Grandet kills Eugenie's mother, which sends him further into a maddened state. Later, it is revealed that Eugenie is not really Monsieur Grandet's daughter; if she knew, then she could reclaim all of the gold that originally belonged to her mother, leaving her father penniless. Monsieur Grandet has a violent argument with Eugenie, after she finds letters sent by Charles that her father had hidden, and Monsieur Grandet accidentally locks himself in a small room where he keeps his gold. He starts hallucinating and is eventually killed after becoming frantic. Eugenie is now left an extremely wealthy young lady, which only intensifies the pressure put on her by two competing families to marry one of the suitors. She announces her engagement, but shortly after is reunited with Charles.